Get rolling again in no time. Lezyne's Alloy Drive provides efficient and easy-to-use CO2 inflation and doubles as a storage canister for your cartridge. The body is made from 100% CNC-machined aluminum for precise and lightweight operation. TriggerValve operation makes it easy to control inflation, and the Twin Chuck head threads directly to Presta or Schrader valves. 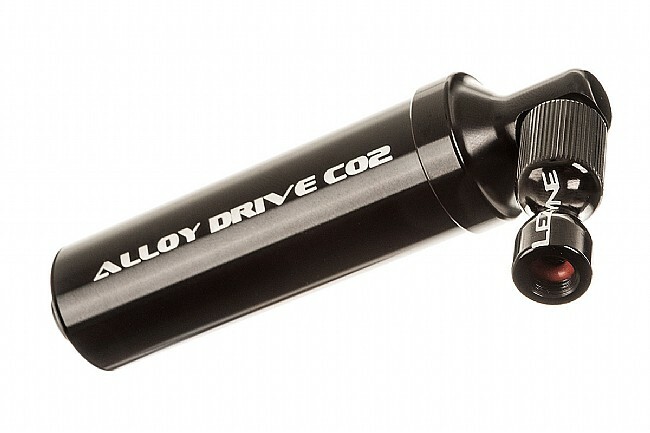 The Alloy Drive CO2 Inflator measures 110mm long and weighs 114 grams (47g inflator and included cartridge). Compatible with 16g threaded cartriges only. For use with Presta or Schrader valves. High Polish Black. keeps cartridge ready for use inside cylinder which insulates during inflations. Weight no difference if you are carrying cartridge anyway. Make sure you review the instructions before your first try. A practice run is advised but it works great and fits in your seat pack nicely. Very nice inflator - Highly recommended!! Honestly, At first I was a bit hesitant about the perceived weight, it just looked heavy to me but I really liked the features and I have found Lezyne quality to be top notch in the past, so I took a chance. After receiving it & quick review I was not disappointed in the Quality or build - very nice and cleanly produced, perfect threads, anodizing is ink black. As for weight, not as bad as I expected at all, far lighter than it looks, and is actually lighter than the cartridge it uses. Head30grams, Cartridge cover20 grams and a 16 gram threaded CO2 cartridge60grams, the cover allows you to keep one cartridge inside with the cover threaded closed - will not puncture the cartridge (you have to thread the cartridge to the head to puncture). As far as function, I especially like the fact that the head is threaded to mate to a Presta valve, no more trying to press it on a deflated tube while trying to put sufficient pressure on the inflation mechanism to get the gas to flow (half of it leaking past the valve while it freezes your thumb & finger tips off). You can thread this head tightly to the valve (no leaks) and easily depress the inflator to get that gas going, let off and it stays threaded on the valve - no fiddling! Very nice device - Highly recommended! !